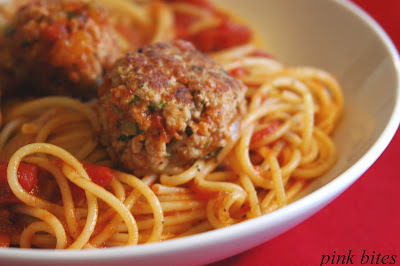 These meatballs are a freezer staple here at home (for Andrew's meals). I keep a bag of frozen ones for those days when you don't have time to cook something from scratch or just don't feel like doing much in the kitchen. It allows me to make a healthy and substantial meal in very little time. Having some marinara sauce ready in the refrigerator makes it even faster. The bread is whole wheat and the meat is turkey which makes this a healthy recipe. Instead of using breadcrumbs, the fresh bread slices are processed and than soaked in milk, which makes the meatballs very moist (no one likes dry meatballs). In the food processor, chop the bread slices until crumbs form. Soak fresh bread crumbs in milk for about 10 minutes. Place all ingredients in a bowl and mix it well. With damp hands, form balls of about 2 tablespoons large each. Place meatballs in a baking tray lined with parchment paper and freeze until firm. Transfer to a resealable plastic freezer bag, it will keep for up to 3 months. When ready to use, cook meatballs with marinara sauce in a covered saucepan until done.